One of the things you discover growing up as a person of colour is that seeing someone who looks like you as a lead in film or TV is a rarity. And to see that person outside of racist, reductive stereotypes? Near impossible. The few films in which people of colour – and in particular black people – lead the narrative are often set against the backdrop of historical oppression. So, to be presented with a film led by four black women, exploring black sisterhood and friendship with no links to slavery or Jim Crow, almost feels groundbreaking – a sad reality within a staunchly white Hollywood. 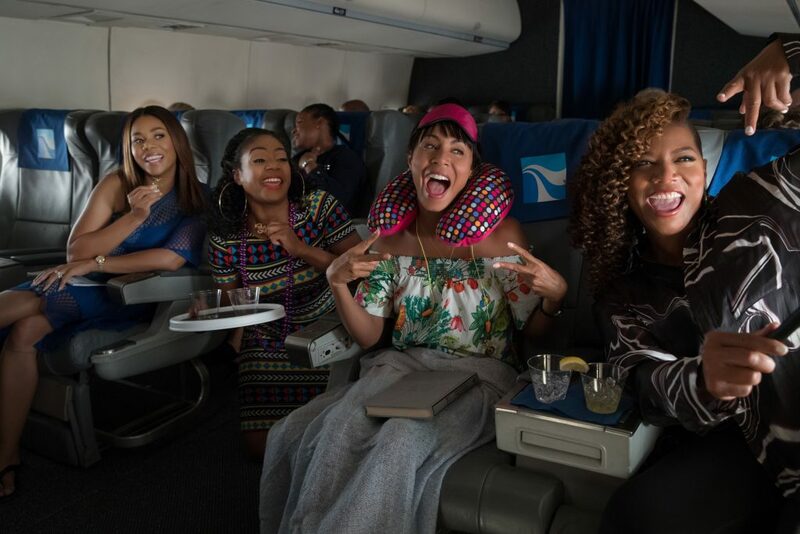 Girls Trip follows four college best friends (played by Jada Pinkett Smith, Queen Latifah, Regina Hall, and Tiffany Haddish) better known as “The Flossy Posse”, reuniting for a wild weekend to New Orleans Essence Festival – a trip which tests relationships and sisterhood. It’s the summer comedy we’ve all been waiting for – it’s dirty, it’s eye-wateringly funny, and it’s an all black female cast with no signs of tiresome tropes. We sat down with Jada Pinkett Smith and discussed Girls Trip’s box office success, black female stereotypes within film and carving out a space for blackness in Hollywood. Funnily enough, representation sells. Who knew that seeing someone who looked like you as a lead on-screen would make people actually want to go to the cinema? Costing only $19m to make, the star-studded comedy has already raked in $31.2m in its first three days in the US. Girls Trip is safely in the canon of black excellence in film released this year along with the likes of Fences, Moonlight, Get Out and Hidden Figures, with critics already hailing the film as the comedy with a black female cast which proved Hollywood wrong. However, as Jada passionately explains when we discuss Hollywood paying attention to black majority films, the work doesn’t end here. “We have to get more blacks behind the camera in regards to writing, directing, producing, because that’s really where we can make progress and make a difference.” Understandably, if we’re to see more films like Girls Trip in the future, black people have to create it. “We need the projects,” Jada continues. “We need the scripts, we need the people to produce and direct movies that understand our experiences”. And that’s exactly what makes Girls Trip so enjoyable – it understands lived experiences. Jada goes on to compare the differences in marketing strategies between her 1996 cult classic film Set it Off – also starring four black female leads, including co-star Queen Latifah – and how Girls Trip has been marketed 20 years on. She tells us Set it Off was marketed as an “urban movie” even though it obviously had “universal themes and crossover as well, but we just didn’t have that available to us at that time.” In that respect, the industry is shifting. Girls Trip is pioneering as it stars black women without being categorised as an “urban” film. It’s just a “summer hit movie” for everyone to digest. Watch the film with your sisters or best friends, it’s the perfect self-care remedy. You’ll leave Girls Trip with your jaw aching from laughter and the sudden urge to text a friend you haven’t spoken to in a while. It’s refreshing, it’s actually funny (without punching low for laughs,) and you’ll never see grapefruits in the same way again.